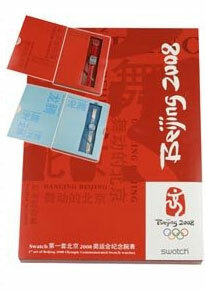 This year the 2008 Olympics in Beijing marks another year of fascinating Swatch Olympic Watches. Swatch is the official timekeeper of the Olympic Games as always. The commemorative watch is specifically made and designed towards the host country of the Olympics. Each watch made in the series is provided with a box with decorations of the games and language. Swatch has been the timekeeper for the Olympic games since Atlanta 1996,2000 in Sydney and 2004 in Athens and now 2008 Beijing Olympics. I own the China Dreams Swatch Olympic Watch Edition (Swatch #751) . It is made of cloth and contains strips all the way down the band with Chinese Characters which I’m not sure of at the moment. The band holder has the Olympic Logo embroidered in white. The swatch watch band contains roses or flowers in blue, pink, red and yellow throughout the strips. Inside the watch dial, it is white with a rose aligned to the right in red with a slight blur. The numbers are inscribed in a violet blue color with all numbers visible. The watch is water resistance but I wouldn’t put this watch close to water because it is a Olympic edition. The battery is standard swatch watch size. Chinese porcelain is the basis for the design of this watch. The textile on linen strap has the ageless flower motif of vases designed centuries ago. The strap is attached to a transparent case that frames the dial depicting a red rose. The blue Arabic numbers are all present. A silver hour and minute hand and a blue second hand mark the time.